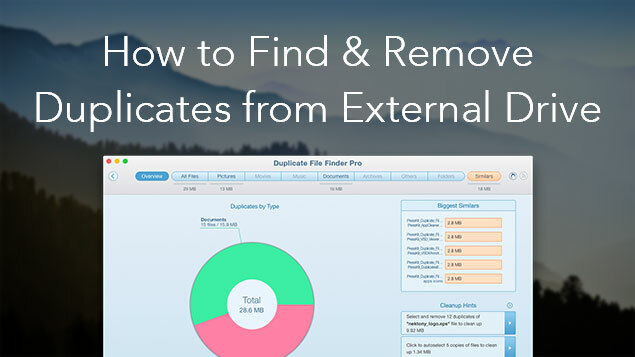 If you are looking for the best software to remove duplicate files on Mac, a free application Duplicate File Finder is exactly what you need. It allows you to identify double files on any disk or folder on your local disk, external drive or network drive. 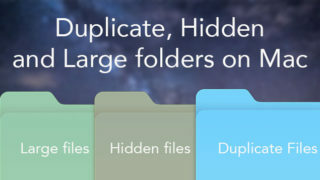 Whether you are looking for duplicate videos, music copies, duplicate pictures or any other duplicate files, this duplicate detector will save you time, and help clear gigabytes of useless file copies. This app is a fast duplicate file finder. However, we would like to give you some recommendations to improve your experience and help you identify duplicate files on your external drive in less than a minute. Recently, we were asked by one of our users what to do if the search for duplicates on a huge external disk takes too much time. Let’s see why this may happen and how it can be solved. First, we would like to mention that the scanning time depends on the speed of your disk and its connection speed. 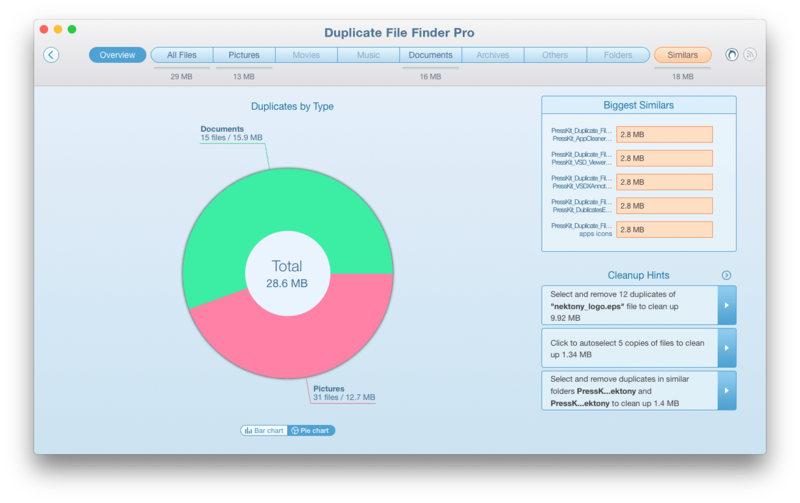 Duplicate File Finder compares the files’ content byte-to-byte to identify duplicates. 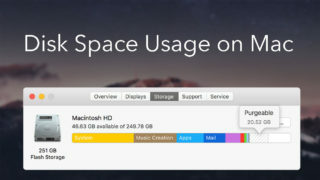 A slow disk or slow connection interface may increase the search time. Nevertheless, you can scan, not necessarily the whole disk, but specified folders or you can set the minimal file size of files for the scan. If you use your External drive for making Mac backups and want to find duplicates on the drive, it’s strongly recommended that you add the Time Machine backup folder to Skip List. Time Machine tracks the changed files and makes backups on the hour. 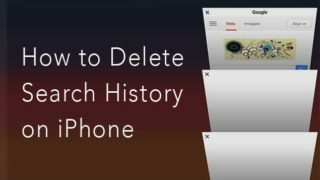 This means that when Duplicate File Finder scans your drive, it checks useless data of tons of backup copies byte-to-byte, which may take a lot of time. 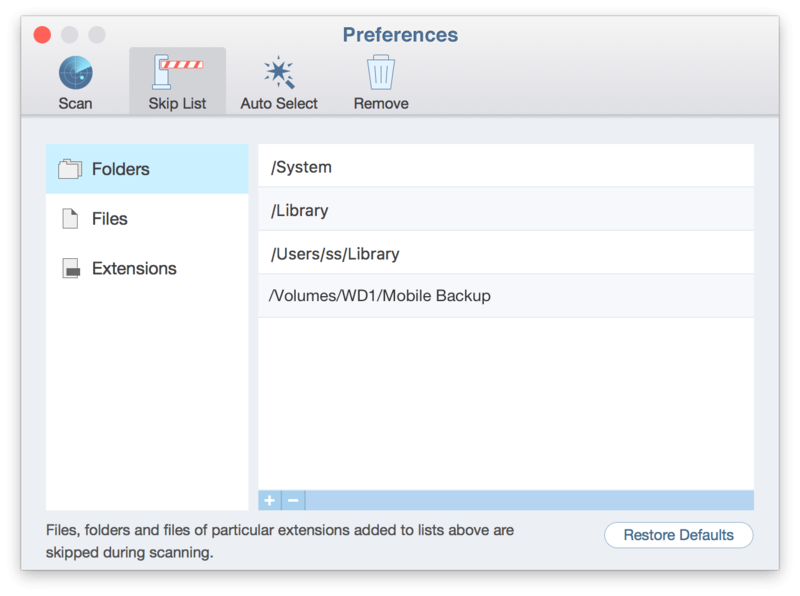 To exclude backups from being scanned, go to the app’s Preferences and switch to the Skip List tab. Here you can add any folder to the Skip List. Use the “Plus” button to add any folder or your backup folders to Skip List. 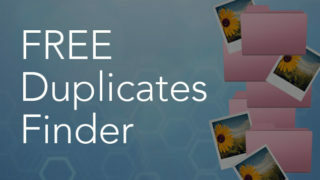 If you want to find only the biggest duplicates and quickly free up some disk space, you can limit the size of files to be scanned and skip scanning the smallest files; this means the smallest files will not be checked. As a result, you will find the biggest duplicates in minutes. 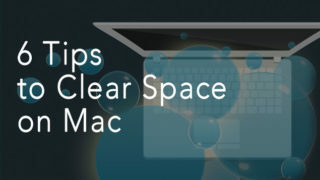 It makes sense to use this tip when you have a huge and slow external drive. 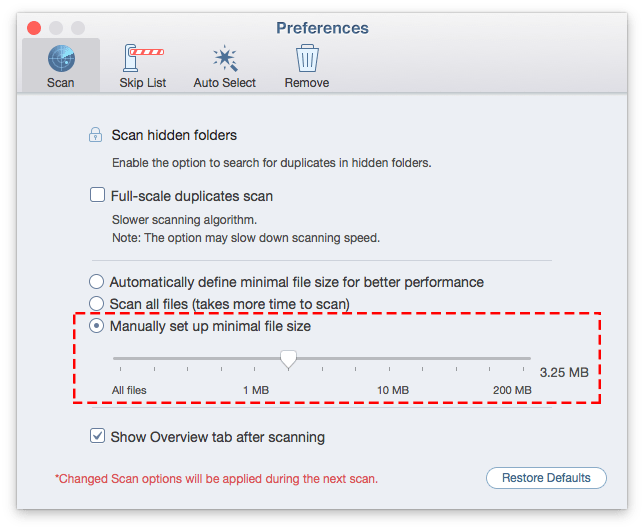 To change the app’s settings and skip scanning the smallest files go again to Preferences → switch to Scan tab → select “Manually setup minimal file size” and change the reflection on the slider. You can set different sizes for better performance and find as many duplicates as you need. Note, when you scan an external drive, you should check some important points for the successful removal of duplicates. Your external drive should have a Trash bin, which is created when you remove a file via Finder. Your disk has the necessary extension (NTFS) and is writable. You should have a driver on the disk, which allows you to manage its files. We hope these tips are useful for you. Here is also a set of articles about Duplicate File Finder software that may interest you. How to Set Up the Minimal File Size in Duplicate File Finder. If you still have questions, feel free to contact our support team. We are here to help you.